The Wampum Trading Post in Sam Simeon, California closed late in April 2016. Wampum Trading was the original inspiration for the “Gifts from the Sea” shop in my novel, Life in Harmony. Wampum Trading with its seashell souvenirs, incense, and Native American jewelry and artifacts became Ruth’s shop in Harmony in my novel (minus the Native American items). 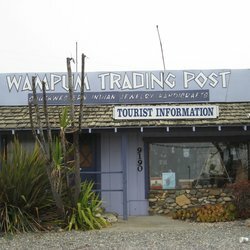 Wampum Trading had been a long-time staple just south of Hearst Castle along Highway 1 between Monterey and San Luis Obispo. I spoke with Nancy, the owner, early in the week that the store closed. She informed me that the building that houses Wampum and Castle Warehouse was being torn down for a new development by the land owner. Wampum Trading like Gifts from the Sea was an easily missed treat to those speeding along Highway 1 up and down the coast. It was a quaint little gem for those who appreciated it. I invite you to read some of the Yelp! reviews for the store and it’s neighboring store Castle Warehouse (while there are two different businesses both share the same roof so it was really hard to tell the difference). Many of the reviews are similar stories to what happen to Kate and Michael in Life in Harmony.